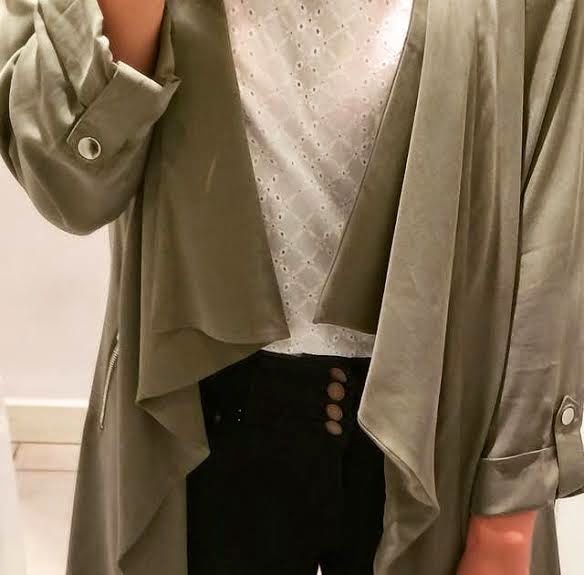 Purchase of the day, this fab new khaki waterfall coat from New Look. I’m off to the UK in April for a short week and was excited to buy some warmer clothes for a change – I was hoping to get my hands on a nice mac for the in-between season weather but instead, fell for this light weight jacket in an earthy gauge colour. It’s great to wear over both day and evening looks. I paired it here with a high waist pair of denim jeans and a lace cut-out top (also from NL) but think it’s the type of jacket you can wear with midi’s and evening dresses too. The sleeves turn up for a more casual fit and the open front makes the piece really easy to wear. Love it.